Showing results for tags 'AP Physics 1'. I am confused about problem number seven part b in this pdf. http://aplusphysics.com/ap1/Problems/AP1 Momentum.pdf I read the given answer, and I am still confused. I don't know how you are supposed to get 0 m/s for the velocity of the block. Why do you use negative impulse for the block when you use positive impulse for the sphere? When do you use negative impulse? Why don't you use the mass of the entire system, which would be the block and the ball? This has to do with it being elastic/inelastic, but I don't know how you can tell from an impulse graph. Help?? Walk-through of the 2017 AP Physics 1 Free Response Questions. Questions can be found at https://secure-media.collegeboard.org...For more information, please visit http://aplusphysics.com*AP and Advanced Placement Program are registered trademarks of the College Board, which does not sponsor or endorse this work. AP* Physics 1 Essentials is an easy-to-read guide to the entire AP Physics 1 course, featuring more than 600 worked-out problems with full solutions and deeper understanding questions. AP Physics 1 Essentials covers all major topics included in the AP Physics 1 course, including: kinematics, dynamics, momentum, impulse, gravity, uniform circular motion, rotation, work, energy, power, mechanical waves, sound, electrostatics, and circuits. AP Physics 1 Essentials is integrated with the APlusPhysics.com website, which includes online question and answer forums, videos, animations, and supplemental problems to help you master the essential concepts of physics. This book is designed to assist physics students in their high school AP Physics courses both as a guide throughout the course as well as a review book to assist in end-of-course exam preparation. Its focus is on providing the bare bones, essential concepts necessary for success in the course in a straightforward and easy-to-read manner, leaving development of in-depth problem solving and lab work to the classroom, where it is most effective. In short, this is not intended as a substitute for a standard textbook or course, but rather as an invaluable supplementary resource. 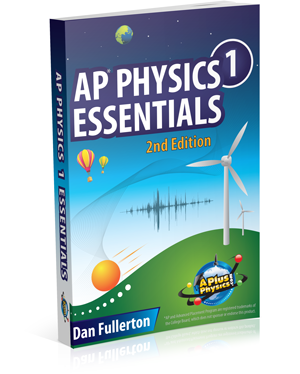 New 2nd edition includes more than 90 AP-style problems to test your understanding and help prepare you for the AP Physics 1 Exam. Additional supplemental AP-1 level problems are available on the APlusPhysics site. Note: This is a license for a digital download of the PDF version for use by one person only on up to five electronic devices. This document may not be printed, edited, re-distributed, re-sold, or licensed to any other user. Once the file has been downloaded no refunds will be given. *AP and Advanced Placement Program are registered trademarks of the College Board, which does not sponsor or endorse this product. In the following diagram, a force F acts on a cart in motion on a frictionless surface. The initial and final velocities of each cart are shown. Rank the energy required to change each cart's velocity from greatest to least. A: Weighs 2 kg, 5 m/s to 2 m/s - Change in KE = 1/2*2*(2*2-5*5) J = -21 J B: Weighs 3 kg, 3 m/s to -3 m/s - Change in KE = 1/2*3*(3*3-(-3)*(-3)) J = 0 J C: Weighs 5 kg, 5 m/s to 6 m/s - Change in KE = 1/2*5*(6*6-5*5) J = 27.5 J D: Weighs 4 kg, -1 m/s to 2 m/s - Change in KE = 1/2*4*(2*2-(-1)*(-1)) J = 6 J The answer says that the ranking is C, B, A, D, which doesn't make any sense to me given the calculations I made. Can someone please explain what I did wrong, or clarify the question? In the AP Physics I Essentials book, I'm a little bit stuck on question 5 for Chapter 7 Test Your Understanding. The problem states "A marble is rolled separately down two different inclines of the same height as shown below. Compare the speed of the marble at the bottom of incline A to the speed of the marble at the bottom of incline B. Compare the time it takes the marble to reach the bottom of incline A to the time it takes to reach the bottom of incline B." There is also a picture with a ball on top of an incline that is straight, and another picture with a ball on top of an incline that is curved. I can explain why incline B would result in greater speed resulting in faster time due to the cycloid path/Brachistochrone Curve since the marble is aided by gravity and the beginning is steeper so more PE to KE for incline B etc. etc., but I can't explain it mathematically (w/equations and all). I tried using Work-Energy theorem, but that didn't really work...Also, I'm confused on how we connect the concepts of angular motion to this problem. I appreciate the help! A 0.15-kilogram baseball moving at 20 m/s is stopped by a catcher in 0.010 seconds. The average force stopping the ball is: (A) 3.0x10^-2 N (B) 3.0X10^0 N (C) 3.0X10^1 N (D) 3.0X10^2 N The explanation says that it takes 0.010 seconds for the baseball to accelerate from 0 m/s to 20 m/s, but that doesn't really match up with the question... Is the wording a little weird? 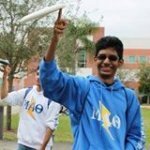 Walk-through of the 2016 AP Physics 1 Free Response Questions. Questions can be found at http://apcentral.collegeboard.com/apc/members/exam/exam_information/225288.html. *AP and Advanced Placement Program are registered trademarks of the College Board, which does not sponsor or endorse this work. Brief introduction to angular momentum for algebra-based physics courses such as AP Physics 1.